Like most creative endeavors, making games is a labor of love. You have to put in many hours, and the results won’t always come out like you had hoped. This is especially true if you work alone, which is one reason, why working with others is a good thing. More on that later. First and foremost, making games is about passion. 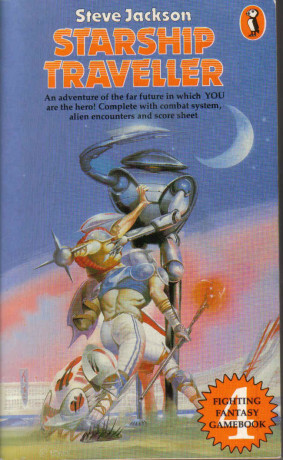 Starship Traveller was one of my favorites as a kid. I love to entertain others, and help them entertain themselves. Two other things I love, are stories and story mechanics. This is why I also dabble in writing. Things started coming together, when I was introduced to the Fighting Fantasy game books. I was raised on books like “The Hobbit”, “The Never Ending Story”, and the Narnia series, but being able to shape a story as I was reading it, making choices for the main character, took things to a whole other level. Immediately, I wanted to make my own stories in this style. This was some time in 4th or 5th grade, aka the mid 80s. Fighting Fantasy became a gateway to Dungeons & Dragons, which completely blew my mind. Suddenly it was more than a story with choices, it was building entire worlds and epic adventures within them, all in the company of friends. I played it only a couple of times, before I took to the game master role. As much as I enjoyed playing, writing has always been a favorite activity, and coming up with adventures, characters and settings, and then sharing those with my friends, brought me immense joy as a kid, and continues to do so now. 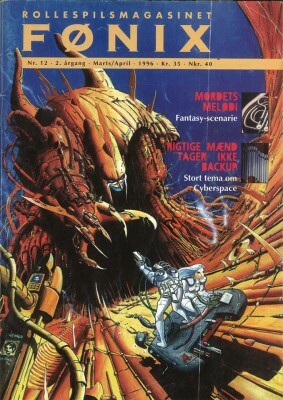 Here’s a cover from one the issues of Fønix, featuring a fantasy adventure by yours truly. I mentioned how working with others is good. As a young gamer, I sought out others with similar interests, found friends, and an interest grew into a lifestyle. We started meeting regularly, and grew in number until we formed a club, organizing events and helping out at conventions. In the mid 90s, I was writing for a gaming magazine, and working part time as “the game guy” in a couple of after school programs. I was in my late teens the first time, I made real, actual money on anything related to games. During this time, I played every kind of game, I could find. Board games, PC games, card games, tabletop RPGs and miniature battles, console games – everything short of gambling, really. It widened my horizon, and I started seeing patterns in how games work, in general, across various genres and types. Skipping forward to present day, about 30 years after first choosing my own adventure, I am mostly focused on video games, however the reasons remain the same: I get to put elements together to form an experience, which the players will (hopefully) enjoy, which in turn makes me a happier person. Why video games, then? Nowhere is a game mechanic purer, than in video games. A computer doesn’t do well with abstract rules that leave room for much interpretation. Everything needs to be precise, or interpreted within specified parameters. Fiddling with that kind of logic and balance is fun. In conclusion, I make games because it makes me happy. It sounds almost selfish, and to some extent it is. I do believe we must find our own happiness in life (again, easier to do with friends), and I aim to do so, by creating good experiences for others.